Jawa Motorcycles, the legendary bike company, had its run on Indian roads till early 90s but the company faded out of existence after sales dropped dramatically. Jawa Motorcycles, the legendary bike company, had its run on Indian roads till early 90s but the company faded out of existence after sales dropped dramatically. 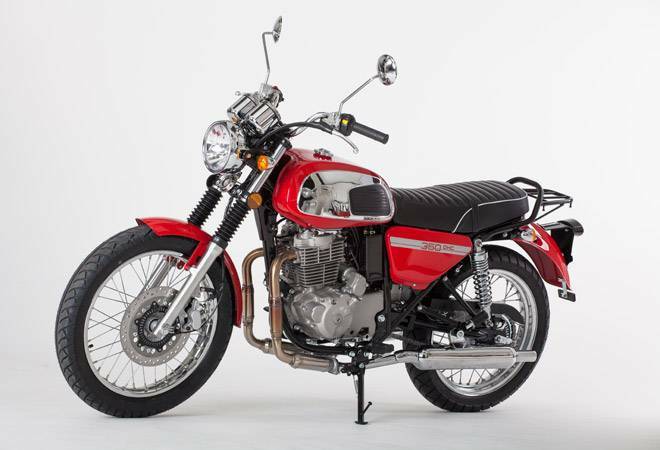 Classic Legends Pvt Ltd, the company in which Mahindra has a 60 per cent stake, bought the rights to the brand in India and is now planning to re-launch an entire series of bikes in the coming months. According to a PTI report, the company is planning to launch three new bikes as early as next month. All three bikes will come with an engine with capacity above 250cc. According to Classic Legends CEO, Ashish Joshi, the new bikes will be unveiled on November 15. When asked about the launch time of these bike, he stated that they will hit the market 'very soon'. The company also revealed a new 300 cc engine that will feature in at least one of the three bikes. The bike will be built with BS-VI vehicle emission norms in mind. The engine will produce and will produce 27hp and 28Nm of peak torque and be mated to a 6-speed gearbox. In an interview with Autocar India, the CEO explained that this engine will have a generous mid-range and a flat torque curve, apart from a heavy focus on the sound that is as close as possible to the original Jawa's exhaust note. Given that the new engine looks a lot like the original Jawa sold in India, the bike might follow the same aesthetics as the old bikes. Last year, the JAWA 350 was released internationally and may set the benchmark of what can be expected in India. The bike retains the nostalgic look of the 60's and 70's with a circular headlight, boxy fuel tank, and a flat seat. It sports telescopic front forks and conventional dual spring suspension at the rear. The design is minimalistic with chrome added profusely to the fuel tank, headlamp, and handlebar. It is equipped with a 17-litre fuel tank, and weighs in at around 154kg. It is powered by a 350cc air-cooled, single-cylinder, four-stroke engine which cranks out 26bhp @ 5250rpm and 32Nm of torque @ 4750rpm. It boasts a top speed of 120kph. The new brand will be launched with around 100 dealerships all over India. These dealerships will be spread across metro cities, Tier II and Tier III cities. The bikes will be rolled out from Mahindra's Pithampur plant in Madhya Pradesh. The company will be competing directly against the Royal Enfield which dominates the 300cc+ segment in India. However, unlike Royal Enfield the Classic Legends owns the brand only in India and won't be export it to markets like Sri Lanka, Bangladesh and other ASEAN markets.